So, You’ve invested in a beautiful new Wrought Iron Gate for your home or office, had the team come out and install it, and it looks gorgeous. Well, we’re glad you’re happy with it! Now its time to protect the investment that you made into this gate. The benefit of a wrought iron gate is that it is one of the most durable and long lasting materials that you could have chosen. However, these gates are still subject to scratches, wear and tear and ultimately rust. I know that part of the reason you bought this gate was to increase curb appeal and the perceived value of your home. So, to protect that investment, We want to teach you some good habits to keep it in the best condition possible, and how to take care of small rust spots if they do show up. 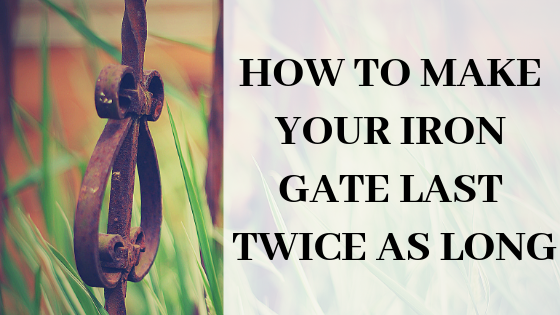 To make sure that you are consistently taking care of your iron gate you should make it a habit to check it every 6-12 months for the growth of weeds, ivy or bushes on or around it as this can lead to scratches that cause rust. If you do see any, just carefully remove it from your gate. Additionally, you should make a habit of washing it every 6-12 months. To do this, fill a bucket with some water and regular dish soap and use a soft sponge or towel to rinse it off. Once you have it clean, you can go ahead and hose it off with warm or cold water. While you’re cleaning it, make sure that you are looking out for areas with rust, and if there are areas that are too narrow to get to, you can use a toothbrush if you would like. If you do find an area with rust, It is pretty simple to fix. Just grab some moderately course sanding paper and a wire brush if you have one. Using these tools, scrub off the rust from the gate and when you are finished, seal it back up with wax, water-resistant spray or metal paint. Once you have finished these steps, you are as good as new. Check it every 6-12 months for weeds, Ivy or bushes growing around it and if they are present, carefully remove them. Wash you gate with soapy water and a soft sponge/toothbrush every 6-12 months. Check your gate for rust, and if it is present, take the actions outlined in the “Rust Removal” section of this blog. Follow these steps, and you will be good to go to keep your new investment last almost twice as long as a gate that goes unattended. If you have any questions, please feel free to email me at bill@irishiron.com, thanks for reading!